The sacred town of Pushkar lies in Northwest in the state of Rajasthan. Pushkar is also unique for being only place to have temple of Brahma, the God of creation. There are no less than 400 temples and 52 bathing ghats in Pushkar and that is why it is one of most sacred places for Hindus. The sleepy town comes alive with burst of activities in the month of Kartik when world famous Pushkar Camel Fair is held every November. Pushkar Fair or Pushkar Mela as called in local language is one of India’s most unique experiences for travellers as it attracts thousands of camels, horses and cattle, besides a big number of tourists – both Indians and foreigners from across the world. This is the time when villagers from from all over the country come here to trade their camels and other animals. It is also time for thousands of Pilgrims to take a dip in the holy lake of Pushkar. During the fair, the sound of bells making heart pleasing jingles, beautifully decked up camels with their owners sitting on their backs has become the most fascinating norm at this stunning cultural fiesta. Silver bells and bangles around camle’s hoofs jingle when they walk past the golden sand dunes. On this occasion, a grand carnival is held, with an array of musicians, dancers, acrobats, and carousel rides to entertain visitors who come from every corner of the globe. One of the most interesting features of the Fair is a unique competition. Beautifully decked up camels parade while competing in a beauty contest and the best bedecked camel wins the prize. In another competition, a number of people are made to sit on the camel’s back. The camel lopes across the sand amidst cheers and jeers from thousands of spectators and throws its riders off its back. 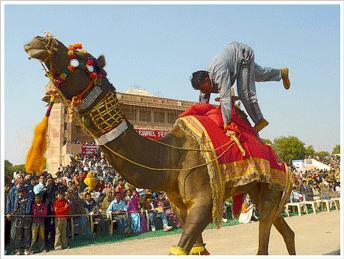 The camel which accommodates maximum number of people on its back, wins the competition. During the event, the area is divided into three parts for cultural programmes, cattle trading and putting up a temporary market, locally known as Haat which comprises of a number of temporary shops selling different types of wares, handicrafts, food items, kitchen grocery, jewellery items for cattle, ranging from saddles, saddle-straps, beads, strings and cowries, to items specifically exhibited for the human folks. Visitors can bargain for silver ornaments and bead necklaces from Nagaur, patchwork, printed textiles as well as the famous tie ‘n’ dye fabrics from Ajmer which are a major attraction. The fair is also famous for the various kind of body tattoos. Pushkar Mela is definitely a priceless treat for those visitors who wish to experience the vibrant culture and traditions of Rajasthan. 5 November–On the dunes, the gathering of camels is reaching maximum size. There are lively discussions as groups of vendors and purchasers meet around their animals and negotiators help to arrange deals. The best prices are achieved in a year when the monsoon has been good. 6 November – By now the tented bazaars are a hive of activity and the fairground is being set up. The scene on the dunes is at its most crowded. Some of the camel herds begin to leave as they conclude their business, but many camel carts are arriving bringing people with business at the fair. Holy men and religious groups are more numerous in the town each day. 7 November–By now a great horse trading area has been established. In some years there have been around four thousand horses; yearlings, horses used by farmers, the white horses which are auspicious for weddings, and fine Marwari horses from stud farms all over Rajasthan and the Punjab. Buyers and onlookers gather round as owners show them off. 8 November – More and more people are arriving.The fair is traditionally a great meeting place where even marriages may be arranged. In the stadium the Official Program of camel races, displays and competitions begins. 9 November – The scene on the dunes is increasingly busy and chaotic, with camel cart rides, itinerant musicians and vendors. Around the stadium there are cultural activities, competitions and bazaars. Camels and traders will disappear back into the desert as the week progresses and their business is concluded. 10 November – Pushkar Fair The town, temples and bazaars are becoming more crowded. The colourful fairground attracts huge crowds with stalls, street vendors, sideshows and ferris wheels. Stadium events continue. 11 November – Pushkar Fair Great numbers of colourfully-dressed villagers are arriving from all over the region to bathe in the holy lake. The fairground is going full swing. A craft fair is set up with handicraft stalls. 12 November – Pushkar Fair Pilgrims throng the streets of Pushkar and shop in the fairground bazaars as the town prepares for the KartikPurnima religious festival. In the mela stadium competitions and events are in full swing. 13 November – Pushkar Fair The temples, ashrams and dharamshalas (pilgrim rest houses) of the holy town are busy with pilgrims. There are bhajans (devotional hymns) and ceremonies in the temples, and fairground rides and stalls to be enjoyed at the mela. 14 November – KartikPurnima Today thousands of devotees will bathe in the holy lake, believed to have been created when the god Brahma dropped a sacred lotus flower to earth. 14 November is the last day of the Pushkar Fair Official Programme and is the day of the KartikPurnima religious festival, when many thousands of devotees throng the town to visit the temples and circumambulate the holy lake. At Chandrabhaga there is pilgrimage activity and holy bathing at Chandravati as KartikPurnima is celebrated in a simpler style, an opportunity to experience the age-old devotions and rituals of the auspicious day.